James Gunn is still directing The Suicide Squad even though he's been rehired to helm Guardians of the Galaxy Vol. 3 by Disney. Gunn was fired rather unceremoniously from his gig directing the third Guardians installment last year after some old, offensive tweets resurfaced online. That led to Warner Bros. scooping him up for the gig directing Suicide Squad 2. 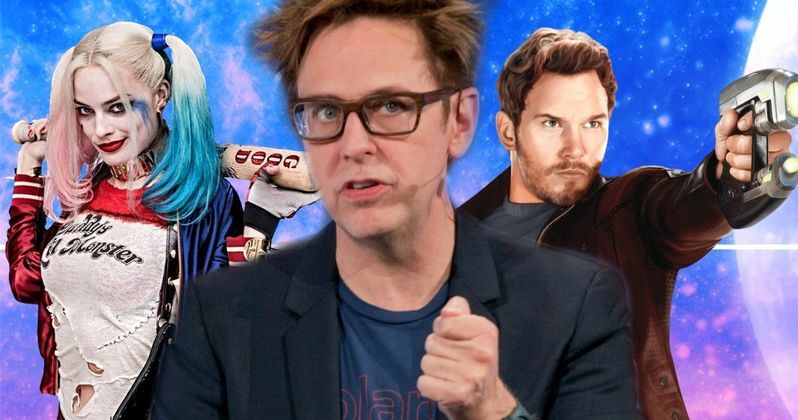 It turns out that all kind of worked out for the best, as Gunn is now going to direct both movies, giving him a firm footing in both the Marvel and DC universes. According to a new report, James Gunn will first direct The Suicide Squad before moving onto Guardians 3. We learned last year that Warner Bros. had hired Gunn to write the script for the DC sequel and after it was revealed he had also signed on to direct, things started coming together rather quickly. All the while, the filmmaker had been meeting with Disney Studios head Alan Horn about possibly being reinstated for Guardians of the Galaxy Vol. 3. That did come to pass, but Disney and Marvel will have to wait patiently until Gunn's commitments in the DC universe are wrapped up. What we know is that The Suicide Squad, as it's being called, is billed as something of a soft reboot, even though it will take place in the same continuity and feature some of the same characters. Deadshot will return in a reportedly significant role. Though, Will Smith will not return and Idris Elba is in talks to replace him. Margot Robbie is also expected to reprise her role as Harley Quinn. Beyond that, this new entry will focus on a cast of new bad guys, which includes the likes of King Shark, Ratcatcher and Peacemaker, who may end up being played by Dave Bautista. The expectation is that production will begin on the sequel before the end of the year. Then James Gunn will head into post-production and, once that's over with, he can refocus his efforts on Guardians of the Galaxy Vol. 3. Gunn had completed a script prior to Disney firing him. So they're good on that front, though, we would expect that a rewrite will be needed. Originally, filming was supposed to begin on Guardians this January before the falling out. To properly tie it in with whatever happens in the MCU between now and when it's release, we assume some things will need to be tweaked. Ultimately, James Gunn will get to make two huge comic book movies and the fans will be the ones who probably win here. Unfortunately, it just means we're going to have to wait a long time for Guardians of the Galaxy Vol. 3, as The Suicide Squad isn't scheduled to hit theaters until August 6, 2021. We'll be sure to keep you posted as any further details on either project are made available. This news was first reported by Deadline.